I was working on a spreadsheet yesterday and something went wrong with my laptop. The screen started flickering. I was pretty sure it was the battery. So, I removed the battery and let the machine run on the AC adapter alone. The screen stopped flickering. Great. But it’s just a quick fix. I don’t want to keep running my laptop without a battery forever. Oh well. Batteries are consumable after all. Anyhow, let’s learn this expression today: Something is wrong with something. Let’s say, your coffee machine isn’t working. Something is wrong with your coffee machine. You can’t start your car. Something is wrong with the engine. Something is wrong with my watch. It’s running behind. So, would you like to practice the sentence together? Please repeat after me. それはそれ。今日はこの表現、Something is wrong with～ を覚えましょう。例えば, コーヒーメーカーが動かない。 Something is wrong with your coffee machine. コーヒーメーカーがどこかおかしい、故障している、ということですね。車のエンジンがかからない。Something is wrong with the engine. エンジンの具合が良くない。Something is wrong with my watch! 私の時計、故障してる。遅れてるじゃない! 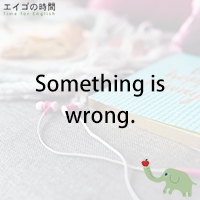 Next Post 故障する – Something goes wrong.